In a heavy climax and with the whole globe upset in front of the three years-old Aylan Kurdi’s dead body, the Finnish Prime Minister, Juha Sipilä, in a typical opportunistic politician move, announced that he is ready to give his house in Northern Finland if necessary for Syrian refugees to stay. The man is beyond hypocrisy any more. Obviously enjoying the popularity his announcement got in the international media he doesn’t want anybody to know the truth. The plain truth is that Finland has reacted badly to any help to countries like Greece and Italy for the refugees waves; the truth is that Mr Sipilä with partner, the leader of the xenophobic/Eurosceptic, basically fascist Finnish Foreign Minister Timo Soini, want to reduce the Finnish yearly quota from 1,500 refugees to 750. The plain truth is that municipalities and officials in Finland have rejected to host any new refugees including the 1,500 they have agreed to take.The truth is that reactions of hate have reached even the social media in Finland against any refugee, a lot starting from Mr Soini's party a few from Sipilä's. The truth is that with half trues Mr Sipilä doesn’t only make a big lie but also a huge Soini. Yes the fascist Soini, the populist Soini, the opportunistic Soini, his partner Soini and as he lately proves his big influence. Mr Sipilä has proved in any possible way lately that he is exactly what Finland needed if they want to ruin everything that has been built the last fifty years. Alexander Stubb was just the beginning but obviously Sipilä is the beginning of the end. First he targeted the welfare, then education and culture, he messed with the labour and now it is about time to go to the essence of everything he represents. Mess with the immigration. And don’t see his announcement, the man is in full agreement with Timo Soini. Blame the immigrants for everything. Blame them for KELA’s failure, blame them for the economy's disaster; blame them for the unemployment and for the bad public services. And now he offers his house to poor refugees? Really? And how is he going to do that? Increasing the Finnish quote he wants to decrease in the area around his house or flying them illegally to his sitting room? The Swedish Foreign Minister, Margot Wallström was right to remind Finns that it was Sweden that hosted in the past Finnish refugees and they did it not out of quota or because they had to but because they wanted to and it was a purely humanitarian act. Pity she didn’t remind them about the Karelia refugees from Russia and the war the same period and how Finland had pledge for help back then. But I suppose they weren’t …Syrians, were they Mr Sipilä? 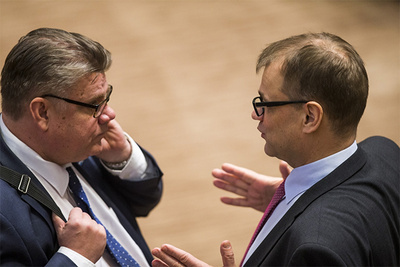 Finland is in serious trouble and either Sipilä or Soini prove it with their actions, let’s hope that in this case the old saying that “every republic deserves the leaders it has” is ...not true!